Whether I'm strolling around my NYC neighborhood, traveling domestically, or visiting a far-flung land, personal safety is always a concern. Being a savvy traveler, especially as a woman traveling alone, means always being aware of your surroundings and sizing up those around you. I'm often asked to talk or blog about women's travel safety tips that include dressing culturally correct, avoiding hotel rooms on the first floor, and checking the elevator before you get in. Because I'm so focused on travel safety and security, that's why I decided to review and highly recommend a new personal security app: LifeLine Response. Available for the iPhone or Android, LifeLine Response is unique among personal security devices. If you're about to be attacked – and, as we know from news reports over the past 12 months or so, assaults against women are on the rise in the U.S., especially on college campuses – you need something that doesn't require you to do a whole lot to prevent the attack from taking place. After all, when attacked, your mind may go blank or you may not have time to push a button on an alarm, take out pepper spray, fumble while trying to dial 911, or even open up an app on your phone. 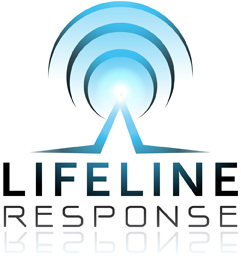 Enter LifeLine Response that launched in September 2012. When it's set on “Thumb Mode,” it operates like a “dead-man's switch. In other words, your thumb comes off your smartphone's touch pad – as would surely happen with an attempted assault – and the countdown starts. (If your thumb accidentally came off your phone's screen, you can still enter a deactivation code.) But, if it's a real attack and you don't enter the proper code, the process is set in motion, no matter if the phone is confiscated by your attacker. The result: an alarm sounds and a male voice “Lawrence” announces that the police have been contacted and are on the way. LifeLine Response's verification center will contact you to find out if it's really an emergency. If you're being forced to say everything is fine, when it's not, you can enter the silent alarm code, instead of the deactivation code. The attacker will think you've disarmed the app. What they don't realize is that entering the silent alarm code or not responding at all tells the center that it's truly an emergency and they will call local 911 who will have your location based on GPS coordinates. In addition, all your contacts (life lines that you had entered into the system initially) will be alerted with a text message and your GPS coordinates. And, if you're a college student, the system can alert campus security. This “Thumb Mode” is perfect if you're just walking to your hotel, for example. But if you plan to go jogging for an hour or so, you can set it to “Timer Mode” so that you're not forced to holding your thumb on the screen. Again, if you don't use your disarm security code, the alarm will go off with the same results as above. It took two years to develop a prototype. We want to empower people to prevention. There's an epidemic of assaults in the U.S., with with one in four women and one in 15 men assaulted every day. The idea of LifeLife Response is to prevent the attack from happening. We developed it with psychologists. And we also spoke with prison inmates - pedophiles, rapists - to find out what would scare them. We found that 40% to 50% of attackers will leave if they hear an alarm, and 40% to 55% will leave if they hear a voice. We're trying to get 99% of the attackers. With LifeLine Response, if you're attacked, we will know where you are and the police will be there. The lifelines are part of the redundancy. We know your lifelines will not wait to act. With other products on the market, you have to press a button on your phone, or dial 911. It's just not realistic.You can't react responsibly during an assault, unless you're trained. So we take the thinking out of it. All you need to know is your four-digit code. We are the 21st Century 911. I feel strongly that women, men and teens living or traveling in the U.S. should seriously think about getting this app on their smartphone. There's no reason not to. Cost? It's not free but the cost is minimal (a one-year subscription is $21.99) especially considering the risk. Pocket phone? Cahill says false alarms are 0.00002%. Visit the website and see how it works. You'll be impressed with its sophistication, as I was. Would this work outside the US though? Is its use limited to the U.S.? Hi Brette, It's only available for U.S. use at this point. Hi Irene, They're working on having it available for use abroad at some point. What a neat idea. I hope they do expand it for international travelers. Hi Roxanne, I hope so, too. Very interesting. Hope it's will become available internationally soon. Hi Donna, Yes, it's very sophisticated. An international option would definitely be a plus. Very interesting, I would think it would be a great idea for traveling outside of the U.S. too. Hi Living Large, Hoping the international option of some sort won't take that long to be operable. It is too bad that we have to fear traveling alone, but that is a sad reality. Glad someone came up with a security device like this. Oh wow, this sounds great. I'm actually thinking it would be good for hiking around our area right here. There have been some attacks on some of my favorite walking trails around town, and I'd feel safer having something like this. Hi Sheryl, I totally agree. So sad to go hiking on a trail alone, for example, and have to fear not the wild animals but a potentially threatening human encounter. Hi Jane, Here in Queens where I live in NYC, we're also having an upswing in violence against women on jogging and hiking trails. Sounds like a good option to have while traveling. Hi MyKidsEatSquid, I think it's great for traveling, doing errands around town or on college campuses. 24-hour security in your pocket.